HORSE EVOLUTION: How do you explain the evolutionary sequence of horse fossils? Let’s consider the actual evidence. Hyracotherium was named in 1840 by English geologist Richard Owen who invented the term when he examined some teeth and rather fragmentary bone specimens, which he identified as being “like a hyrax”. At that time no-one suggested Hyracotherium was the ancestor of horses. Darwin’s theory of evolution was not published until 1859, and Owen, the world’s leading expert on fossils, and founder of the famous Natural History Museum in London was an implacable opponent of the theory until his death. Owen also coined the word “dinosaur”. A hyrax is a creature that is still living, and bears no resemblance to a horse, apart from being a four legged furry mammal. It is a small creature with four toes and low crowned teeth, and currently lives in Africa and the Middle East. It can live in a number of environments ranging from dry savannah to rainforests. Most hyraxes are completely herbivorous, eating leaves, grasses, fruit and flowers, although rock hyraxes, which live a semi-arid rocky places will also eat insects, small lizards are birds’ eggs. How did the link between Hyracotherium and horses come about? Fossils found many years later in North America which were named Eohippus, or “Dawn Horse” have since been identified as Hyracotherium, and since these fossil hunters wanted to promote evolution, they argued the hyrax to three toed to one toed horse family tree which soon entered most textbooks. But the reality is that Hyracotherium fossils look no more like horse fossils any more than living hyraxes look like living horses. As an aside, you should note that Owen’s original classification name stands as he coined it first, and eohippus is a redundant meaningless term in real science. As a result of the above history the usual horse evolutionary sequence, as shown in school courses on evolution, is as follows: Hyracotherium, a small mammal with four toes and low crowned teeth suitable for browsing gave rise to Mesohippus, a slightly larger mammal with three toes and browsing teeth. Mesohippus then gave rise to Merychippus, which was about one metre tall and had three toes and teeth more suited to grazing. Merychippus then gave rise to Pliohippus which was the size of a small pony, had a single hoof and grazing teeth. Pliohippus then gave rise to the modern horse Equus. In many evolutionary trees these intermediates are split into a plethora of subgroups and individual species, all of which are extinct. For an example of this sequence in current High School course material see BBC Bitesize. The fossils of the extinct multi-toed intermediates in the horse evolution sequence were originally found in North America, and were used as evidence for evolution by Thomas Huxley, who was the chief promoter of evolution in the late 19th Century. Since then more of these fossils have been found in other parts of the world, which don’t fit this evolutionary sequence. This has been acknowledged by evolutionists for many years. For example: A. S. Romer stated that in South America the one-toed fossil is found below the three toed fossil. (A.S. Romer, Vertebrate Palaeontology, 3rd Ed. University of Chicago Press, 1966). In the Ashfall mammal fossil bed in Nebraska, USA, there are three-toed and one-toed supposed horse ancestors buried in the one massive volcanic ash layer. See illustrations from Ashfall Fossil Bed State Historical Park here. If you want to see a funny side to all this then consider a display in the British Natural History Museum, long sold out to Darwin’s evolution, where a study of the Hyrax to Horse History reports in a display of hyraxes that “There is a continuing debate about these small mammals. Are they closely related to horses, rhinos and tapirs? 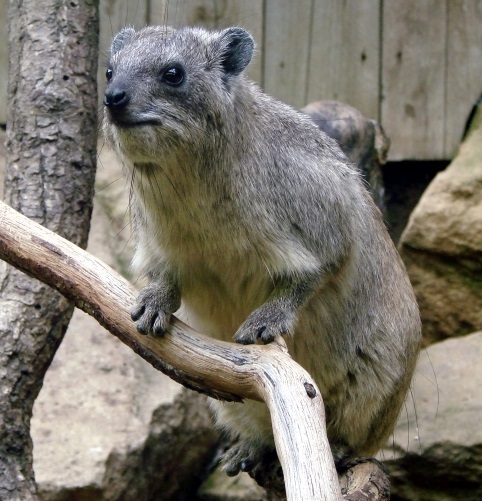 … or more closely related to elephants and sea cows?” A hyrax looks even less like a sea cow or an elephant than it looks like a horse. John Mackay reports going on a guided tour of the San Diego Zoo where the guide pulled up the crowded people carrier alongside the Hyrax exhibit explained they were looking at the ancestor of the horse and/or the elephant. Silent awe was suddenly replaced by total laughter, and an embarrassed guide explained that he thought it was stupid, too, but they paid him to say it! In summary, what is the actual evidence? It is: two living genera of mammals, hyraxes and horses, which bear no resemblance to one another; and any number of fossil species and genera, depending on who is doing the classifying, of extinct animals, which are neither hyraxes nor horses. Any evidence for evolution based on this assemblage of living and fossil animals exists only in the minds of evolutionists, who are imposing their theory on the evidence, not deriving it from the evidence. All the named fossil intermediates in the evolutionary story are now extinct, so the only living creatures we have to observe are hyraxes and horses. There is no evidence that any one of the animals in the horse evolutionary story, alive or extinct, was derived from, or gave rise to, any other kind of animal. Living hyraxes and horses are only ever observed to give rise to their own kind, just as Genesis says they were created to do. The fossil creatures certainly existed at some time in the past, but as they are now dead they cannot be observed to reproduce. Fossils cannot prove evolutionary transitions. Transition is an active process and cannot be observed in fossils. Fossils can only prove that once-living things were buried and preserved. The fact they can be classified and placed in evolutionary sequences, e.g. progression from four toes to one toe, or browsing teeth to grazing teeth, does not prove that one changed into the other. The theory that one changed into another is a belief imposed on the evidence, not observed in the evidence.